This is a perfect soup for day three of a constant downpour here in Seattle. Years ago I was skimming through a friend’s cookbook and found this recipe. I asked her for a scratch piece of paper and all she could find was a sticky pad. Using a red ink pen, I proceeded to handwrite the recipe in the tiniest penmanship I could in order to fit it on the two sides of the 2×4 sticky paper. Here we are nearly thirteen years later and I finally made the soup! The flavor base of this soup is exceptional. You first make a buttuto, which is a combination of onion, celery, garlic, carrot and pancetta (or bacon). The name buttuto (italian) means to strike or, in this case, chop. Once you have chopped your buttuto it becomes a soffritto, which simply means to sauté over high heat until lightly colored. Chop and sauté. So simple, flavorful and a beautiful foundation for this comforting soup. Make the pesto. Place all the pesto ingredients in a food processor and whizz until finely chopped. Season with salt and pepper, and set aside. Heat oil in a heavy bottom pot over medium-high heat. Add pancetta and cook, stirring often, until fat has rendered, about 2 minutes. Add garlic, carrots, celery, and onions and reduce heat to medium. Cover and cook stirring occasionally, until crisp-tender, 12–15 minutes. Add zucchini and cabbage. Cover and cook until wilted, 3–5 minutes. Add stock and tomatoes and bring to a boil. Add pasta and cook until al dente, about 8 minutes. Drain and rinse the cannelini beans. Mash half the beans with a fork and add to the soup along with whole beans—cook until warmed through. Season with salt and pepper. Ladle soup into bowls and serve with pesto dolloped on top. Mine are not organized at all! :) I think that is why it took 13 years to find this recipe. haha! Seriously! It has become so chilly here the past few days, we need something to warm us to the core. I could live on soup too. I love it. That looks lovely :-) Still in the ’80s (F) here, but one of these days we’ll have our usual day of fall, then long stretch of winter (am in Minnesota), so I can see myself making plenty of soup eventually. This one will make the list! Wow. We were lucky to have a few 80°F days in a row this summer! We just don’t have real warm..or cold days here. Our lows are normally just above freezing. So mild in this part of the USA. We’ve had 10 days of rain and gale force winds! I made minestrone yesterday which we enjoyed with the last of the summer pesto, I like your method of making a sofritto, it must add a sweet richness to the soup. Next time I’ll give it a try. It was last summers pesto from the freezer, sorry if I confused you! We’ve been hearing about your rain. I hope you’re staying warm and dry. The soup looks delicious. Thank you. In my opinion, the pesto really made the soup. Without it the soup was ok, pesto makes everything better. mmm mmm. you know i love all things pesto. i might have to see if i can japanify this soup somehow, because i have a snowball’s chance of getting fresh basil, parmesan, or cannelini beans. no maam. lots of people grow it, but it doesn’t really appeal to most japanese people as far as flavor goes. they like margherita pizza, but that is about where it ends. i make pesto out of a leaf called perilla (also known as shiso or beefsteak in the states) because it is about the only thing i can find most of the time. i’ll keep you posted and see if i can sub in some very asian ingredients for the pieces of your recipe i can’t make work. I have never watched “The Killing”! And yes, sometimes it feels as though it does rain every day here. We had a 98 day stretch a few years ago! Sure love our green countryside though. I love a good minestrone too. I think I’m am getting to the point where I don’t prefer any type of beans in my soup though. So, next time I’m leaving them out! This looks so lovely. It’s both simple and hearty. I think the addition of the pesto really makes this dish! I would never have thought to do that. I will come back to this soup as the days keep getting colder. I’m always looking for a way to add flavor to an otherwise, normal soup. I’ve seen coconut milk, but now pesto. Wonderful! What a beautiful soup! I love the pesto in this soup.. how awesome and flavourful and what a great way to use up the basil in your garden! Thank you so much! Thank you so much! :) So nice of you to stop by, comment and follow my blog! Looking forward to looking through your recipes. Thank you! Have an awesome evening! Mmmmm… I just love soups. And I know I’d love this one. Looks fabulous! I’m sending this recipe to my Seattle sister-in-law. She adores bean soups! Thank you for sharing. It has just started raining here in Dublin (Ireland) and it looks like we could be in for a week of it. Great inspiration. I think Seattle may be very similar to your weather/climate. We have had rain for 7 days now, doesn’t look like it is going to let up either. Time for soup! I spent a few weeks in Ballygawley a few years ago and loved the climate. We complain about it. But, we would miss having the changes in weather that make things so interesting here. Never would have thought of pesto! Definitely better than any minestrone I’ve ever had. Useful Italian lesson as well! I can almost imagine how heart-warming and stomach-warming this soup would be on a cold, rainy day in the Northwest… the photos are too good to be true… food (almost) too beautiful to eat! 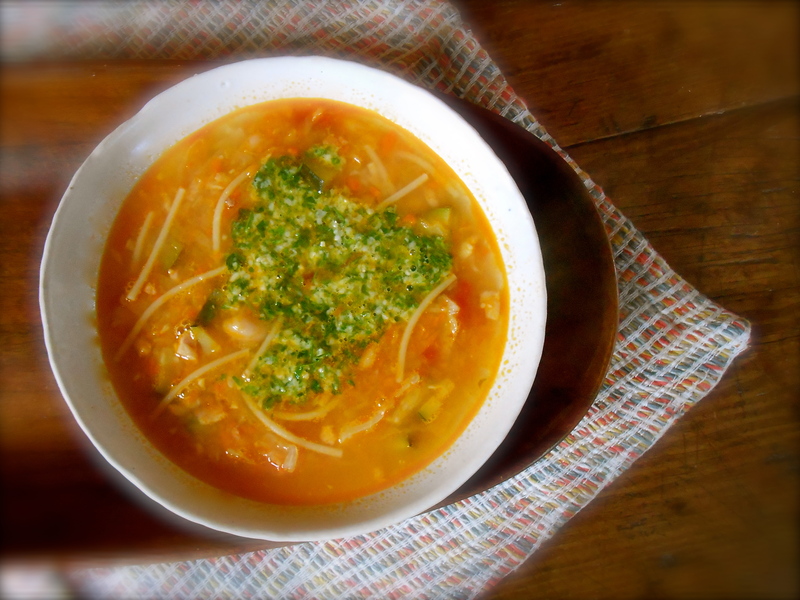 You are currently reading minestrone con il pesto at COTTAGE GROVE HOUSE.